It might seem that reducing the rate of change is not feasible. It is hard to imagine how to reduce the advance of technology. A government could reduce its spending on research, but that would not slow technological advances in other countries, putting the country that cut back on research at a disadvantage. Moreover, reducing research looks like a bad idea, because more advanced science and technology appears essential for dealing with the world's problems. However, other sorts of change can be more amenable to management. Population changes can be influenced by incentives, reducing the need for societies to adjust to changes in the size of the population and the ratio of workers to non-workers. 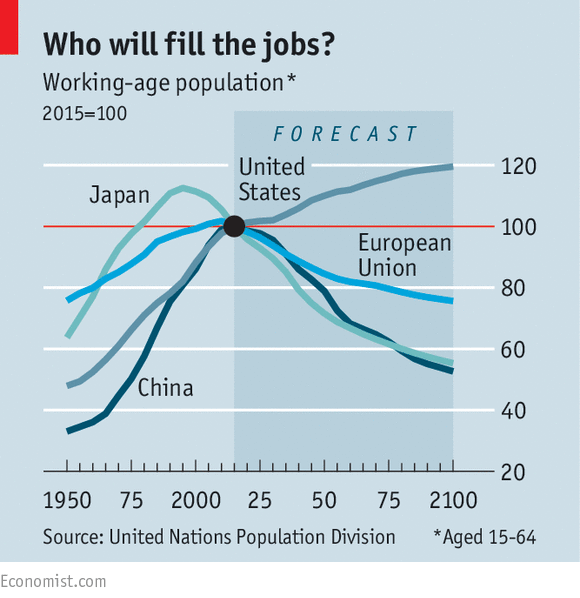 An Economist article on Vanishing workers (July 23, 2016) asks, "Can the [contemporary] debt-fuelled model of growth cope with ageing populations?" ''The world is about to experience something not seen since the Black Death in the 14th century—lots of countries with shrinking populations. ... A new report on the demographic outlook by Berenberg, a German bank, focuses on one important measure: the dependency ratio. This compares the number of children and the elderly with people of working age (those aged 15-64). The higher the dependency ratio, the greater the burden on the workforce. In the world’s biggest economies, America apart, the workforce is set to shrink significantly (see chart). Managing population growth could reduce change in the dependency ratio, thus reducing the amount of change societies need to adapt to.